Dr. Justine Lee is a board-certified emergency critical care veterinary specialist, and is the CEO of VetGirl. For more from Dr. Lee, find her on Facebook! In my opinion, this is too hot to run! If you want to torture yourself and run, go for it. But, in general, only do intense exercise with your dog if it’s < 150. They have fur! Imagine running with a fleece on in that same weather you’re about to subject your dog to. They lack the rapid heat loss from sweat (e.g., as they only have sweat pads in their paws). They don’t know how to pace themselves appropriately (e.g., they’re so excited they are running all over the place initially): "Yeah! We’re going on a run!!!!!" They can’t say no to you (e.g., if I were your running partner and you made me run past 6 miles, I’d verbally turn you down in a second!). They have extra insulation. 40-60% of our pets are obese nowadays, and while we want you to exercise them, that added fat provides additional insulation, predisposing your pet to overheating. I still want you exercising your pet, but take it slow to help them shed that fat! They have been bred to not breathe well. Certain breeds with brachycephalic disease (e.g., the smooshed in face) typically can’t exchange gas and heat well. They are much more predisposed to overheating. My rule: if your dog snores, he’s likely brachycephalic and shouldn’t run in heat! When in doubt, exercise during non-peak heat hours… very early in the morning or late in the evening. Most importantly, if you notice your dog is showing early signs of heat stroke, stop and take a break. Get your dog some water. And when in doubt, walk him home. Treatment for heat stroke includes rapid body cooling, aggressive intravenous fluids, monitoring for organ failure and clotting abnormalities, blood pressure monitoring, urine output monitoring, blood work monitoring, anti-vomiting medication, plasma transfusions, possibly antibiotic therapy, and supportive care. When in doubt, prevent it before instead of paying the price – potentially with a life – later. Some people exercise with their dog so much that their paw pads abrade off. This is a sign of too much running, in my opinion. After all, while I don’t have the most beautiful feet (what I call “cleat feet” from playing sports), I don’t wear the bottom of my feet off! While pad abrasions seem minor (e.g., they aren’t life-threatening) as compared to heat stroke, be kind to your dog. Prevent this, as it can be painful. While the pad has significantly diminished pain sensation, having them completely abraded off so the tissue underneath is exposed is painful. Avoid! 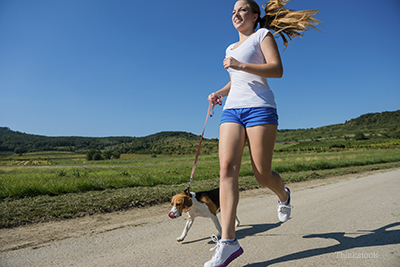 If you have a dog with osteoarthritis or orthopedic problems, exercising is still a great way of keeping pounds off your pet. Studies have shown that skinnier dogs live longer and have less osteoarthritis, so make sure to keep your dog trim for all of his life. However, once a pet has developed osteoarthritis, it can be painful for them to have that constant pounding of running. Take it slow (pace at > 9 minute mile) so they can quickly walk with you; this allows them to still exercise with you, but with less potential for soreness and stiffness. Alternatively, consider swimming! This low-impact sport is great for you and your pet. Last, consider benign medications like glucosamine. Still sore? Talk to your veterinarian about prescription veterinary non-steroidal anti-inflammatories (NSAIDs) to help with the occasional soreness. (Never use human medications on pets without consulting your veterinarian, as even human NSAIDS can cause kidney failure and stomach ulcers with low doses). Kudos for you for exercising with your dog. Keep it up. Just beware the few dangers associated with it.